VaySoft SWF to EXE Converter is an application that help you convert SWF file to professional strongly protected self-running EXE files. Download VaySoft SWF to EXE Converter by VaySoft Ltd.
VaySoft SWF to EXE Converter is an application that will help you convert SWF file to self-running EXE file. 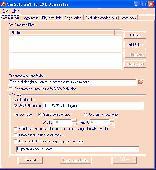 The EXE file can be copied to any computer and will run on Windows 2000,XP ,2003,Vista and Windows 7. PCWin Note: VaySoft SWF to EXE Converter 4.52 download version indexed from servers all over the world. There are inherent dangers in the use of any software available for download on the Internet. PCWin free download center makes no representations as to the content of VaySoft SWF to EXE Converter version/build 4.52 is accurate, complete, virus free or do not infringe the rights of any third party. PCWin has not developed this software VaySoft SWF to EXE Converter and in no way responsible for the use of the software and any damage done to your systems. You are solely responsible for adequate protection and backup of the data and equipment used in connection with using software VaySoft SWF to EXE Converter. SWFKit Pro - SWFKit is the leading SWF to EXE tool. SWFKit can build professional Windows desktop applications, screen savers from SWF movies created by Flash Authoring tools such as Macromedia Flash, Flex, Swish Max, etc. It can also create installers. SWFKit Express - SWFKit is the leading SWF to EXE tool. SWFKit can build professional Windows desktop applications, screen savers from SWF movies created by Flash Authoring tools such as Macromedia Flash, Flex, Swish Max, etc. It can also create installers. SWFKit - SWFKit is the leading SWF to EXE tool. SWFKit can build professional Windows desktop applications, screen savers from SWF movies created by Flash Authoring tools such as Macromedia Flash, Flex, Swish Max, etc. It can also create installers. SWF Decompiler Magic - SWF Decompiler Magic Free Version, a powerful solution that can be used by programmers who need to deal with Flash technology. It is a powerful flash decompiler with the functionality to convert flash files between swf and exe formats and edit SWF movies. Sothink SWF Decompiler-Flash Decompiler - A high-performance Flash decompiler and Flash to HTML5 converter. You can convert SWF to HTML5 and SWF to FLA/FLEX; Extract Flash resources; Edit SWF by editing the shape elements or replacing image/text/sound elements; Get XFL from Flash CS5 SWF. AVI to SWF Flash Converter - AVI to SWF Flash Converter is a software tool to convert any AVI files to SWF files. The SWF files can be converted as raw flash files which you can import into Flash editor to use or edit, and the SWF files can be with or without player controller. Flash Decompiler and Flash Maker Suite - A high-performance Flash decompiler for you to convert SWF to FLA or FLEX precisely; Easily extract all Flash resources; Convert Flash to html5 files; Replace image/shape/text/sound for SWF. It is the first decompiler to get XFL from Flash CS5 SWF. DDVideo Flash(SWF) to XBOX Converter - DDVideo Flash(SWF) to XBOX Video Converter Gain, is a powerful utility that can convert Macromedia Flash(SWF) video to Xbox,Xbox 360 and also can extract audio from Flash file and convert it to MP3,WMA,WAV audio format. Moyea MTS/M2TS Converter for Mac - Moyea MTS/M2TS Converter for Mac is a professional tool for converting MTS/M2TS file to a MP4, MKV, MOD, AVI, MPEG, WMV, MP3, WAV, etc to play on your portable devices like iPad, iPod, iPhone, Xbox 360, Apple TV, Creative Zen, Mobile Phone, etc. Emicsoft FLV to MP3 Converter - Emicsoft FLV to MP3 Converter is a most stable and comprehensive video converter software which is mainly able to convert FLV to MP3 audio with excellent audio quality and fast conversion speed. More Software of "VaySoft Ltd."
VaySoft Video to EXE Converter - VaySoft Video to EXE Converter is an application that help you convert video file to professional strongly protected self-running EXE files. VaySoft PDF to EXE Converter - VaySoft PDF to EXE Converter is an application that help you convert PDF file to professional strongly protected self-running EXE files. MS Excel File Properties Changer - MS Excel File Properties Changer is an application that will help you to view and modify the Microsoft Office Excel file properties such as summary information, file date-time stamps and file attributes. MS Word Document File Properties Changer - MS Word Document File Properties Changer is an application that will help you to view and modify the Microsoft Office Word document file properties such as summary information, file date-time stamps and file attributes. VaySoft PDF to EXE Converter - VaySoft PDF to EXE Converter is an application that will help you convert PDF file to self-running EXE file. PPT to EXE Converter Enterprise - PPT to EXE Converter Enterprise is an application that will help you to convert PowerPoint presentations (PPT) into professional self-running EXE files. Vaysoft JPG to PDF Converter - Vaysoft JPG to PDF Converter is a utility that will help you convert different image file types such as JPG, GIF, BMP, PNG, ICO and WMF into a PDF file. PPTX to EXE Converter - PPTX to EXE Converter is an application that will help you to convert PowerPoint 2007 and PowerPoint 2010 PPTX files to EXE files. PPT to EXE Converter Pro - PPT to EXE Converter Pro is an application that will help you to convert PowerPoint PPT files to EXE files. PowerPoint Slide Show to Flash Converter - This program converts PowerPoint PPT images slides show to Flash SWF.